QUANG NAM (VNS) — Climate change and a reduction in sediment supply and river discharge along the Thu Bon River are the primary causes of coastal erosion in the central region, particularly Cua Dai Beach in Hoi An, speakers said at an international seminar held in Hoi An on Monday. Nearly 200 local and international delegates, including 30 river and coast experts from Japan, Germany, Denmark and Taiwan, attended the international Viet Nam - Japan Workshop on Estuaries, Coasts and Rivers 2015, which ended yesterday. The reduction of sediment supply is mainly caused by dam constructions and illegal sand mining along the river, according to experts. There are eight hydropower plants in the upstream, starting from Ngoc Linh Mount in Quang Nam Province's Nam Tra My District. Nguyen Trung Viet, rector of the Central Region College of Technology, Economics and Water Resources, said the workshop aimed to provide an academic forum for researchers and experts in the field of river, estuaries and coastal engineering. The event played an essential role in seeking solutions to coastal erosion in the central region, especially in the context of serious erosion occurring more frequently at Cua Dai Beach, he said. Many provinces in the central region had not developed a comprehensive long-term plan for the sustainable development of rivers, estuaries and coasts, he added. Current solutions for coastal erosion were temporary and would not achieve sustainable outcomes, and might in fact do the opposite, he said. The measures could cause erosion to neighbouring areas, such as resorts that build their own dykes, which in turn cause erosion to nearby hotels and resorts, he said. Therefore, co-operation between scientists, businesses and provincial authorities was needed to effectively resolve the critical issue, he said. 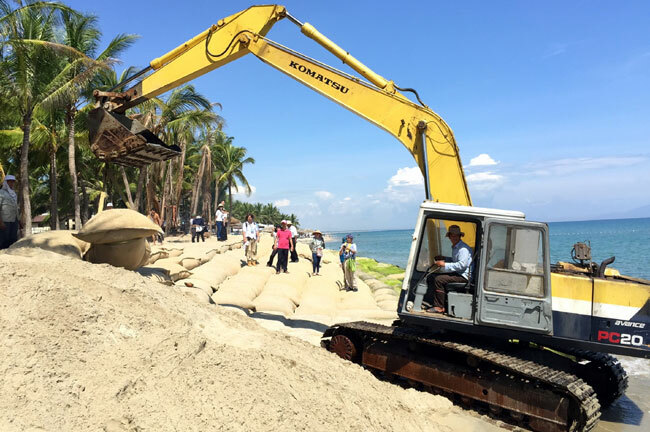 He said it would cost approximately VND1 trillion (US$44.4 million) to tackle coastal erosion in the central region. Tran Dinh Hoa, vice director of Viet Nam Academy for Water Resources, along with his fellow researchers, found that structural changes to the rivers, estuaries and coasts had a serious impact on the province's socio-economic development. In addition, deforestation at the upstream also contributed to the critical issue, Hoa said. Tourism plays a key role in the economic development of Hoi An, which is home to a World Heritage Site, according to event speaker Dr. Hitoshi Tanaka, from Tohoku University in Japan. However, during the past decade, Cua Dai Beach along Dai River on the east side of Hoi An has become severely eroded. The erosion has become more serious in recent years, causing significant changes to the river's structure. An area of sandy beach that stretches hundreds of metres has been eroded. In addition, structures in the area such as coastal embankments, hotels and resorts have had major influences on the evolution of the shoreline. Dr. Hirotada Matsuki, chief advisor of Japan for International Co-operation Agency (JICA), said riverbank erosion was one of the most severe problems in the rural area of Viet Nam, adding that JICA had been supporting river management using Japanese river engineering. The workshop also covered a wide range of topics related to current research, including the effects of climate change, coastal disasters and mitigation measures, and the impact of the construction of structures upstream to downstream estuaries and rivers.